My inspiration for writing this came from the fact that it's currently 11:46 pm on a Wednesday night, and I have the sudden urge to get out my violin and practice. BUT, I'm at home for the holidays. I have a feeling that my family members and labradoodle would not particularly enjoy me waking them up by sawing away at some Prokofiev or Mozart (or really anything) at this hour...even though they are incredibly supportive of me. There's a limit, am I right? So, here I am, still on a caffeine high from my late afternoon coffee, "Psycho" playing in the background (I'm a HUGE Alfred Hitchcock fan), brainstorming ideas of how to practice effectively when the option of heading to an isolated practice room no longer exists. Anyone stuck in the same situation? Here are some tried and true practice methods that are silent, but most importantly, effective. I start every single practice session, no matter the situation, with a series of bow exercises recently taught to me by a wonderful violin pedagogue in the Bay Area. They do wonders for tone and right hand flexibility, and are silent because you're not using the violin, only the bow. I do a mix of exercises for 5-10 minutes, usually starting with circles. Circles are when you simply make circles in the air with the tip of the bow, engaging the bigger muscles in your shoulder and back, as well as the smaller muscles in your right hand wrist and fingers. I eventually move on to bow swings, tick-tocks, thumb lifts, and pinky taps, mixing them up every minute or so for sake of variety. I highly recommend bow exercises for beginning every practice session, but they're especially great when you want to practice and have lots of family in the house, and there's just not a good place to escape with your instrument. These are awesome! Invented by Dr. Shinichi Suzuki, this exercise requires your right arm to be completely relaxed in order to successfully make a 'silent' string crossing. Since I've been doing these, I've noticed that I can do string crossings in context a lot easier, with noticeably less tension. AND it's a silent exercise, so no need to worry about the time of day and/or setting that you're using to practice. Perfect for the busy (and noisy) holiday season! Musicians are like athletes. We are always on the go, physically and mentally, and our craft is extremely physical. When you have a lull in practicing your instrument, drink some water and do some stretches to help your upper body relax and ultimately avoid strain. Taking some time to give your body some love will have a positive impact on your playing, and will just make you feel better in general. One of the most important things we can do as musicians is to practice efficiently and intelligently. How will your practice be intelligent if you don't know what the piano is doing in your Sonata? Or what the orchestra part is in your Concerto? If practicing your instrument is just not possible, take out your score and sit down with a recording of the piece you're working on, marking cues in your part and understanding how the other parts fit together with yours. This may sound really basic and obvious, but it's super important and is often overlooked by busy musicians trying to learn the notes as quickly as they can (I've done it!) It can be great to have some time off from the instrument, both physically and mentally, in that it gives us some time to step back and look at the bigger picture. Instead of getting frustrated about the lack of time available to practice, embrace the time it leaves you to really get to know your music, and have a deeper knowledge of each piece before you pick up the instrument again. So whenever practicing gets tough for one reason or another this holiday season, try these out! You'll be getting things done, while avoiding frustration from lack of an ideal practice setup. I guarantee you that once you are able to go back to your normal practice routine, you will feel a greater connection with your instrument and your repertoire. Happy Practicing (and Happy Holidays)! 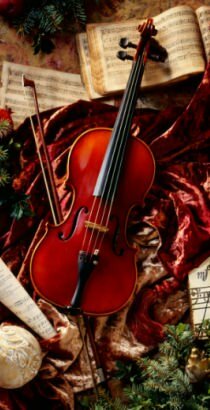 December 22, 2017 at 04:01 AM · How about windshield wipers (holding the bow vertically while letting it swing from side to side), or silent vibrato exercises, or silent sautille exercises to get the fingers to move the bow? December 22, 2017 at 06:25 AM · Merry Christmas, there is also visualization. Find a comfortable position. Close your eyes. Now imagine walking into your practice room or on stage. Hear your footsteps and breathing. The weight of your instrument and bow. Get into play position. Now play your piece or that particular measure that you want to practice. Hear the strings, where are you looking, do you have any tight muscles? Remember this is all visualization, all in your mind, but will feel as though you actually played your instrument. December 22, 2017 at 10:37 AM · thanks for sharing Clara, very inspiring! December 22, 2017 at 11:42 AM · Very interesting! There is a series of silent left hand exercises in Carl Flesch's Ustudien that are both very useful and highly effective. You might want to check them out. December 22, 2017 at 06:43 PM · I'm a little confused on what you mean by silent string crossings. Could you clarify that one? December 22, 2017 at 10:51 PM · Yes! Silent string crossings are when you put your bow on the string and simply cross each string without actually drawing the bow...so you're practicing string crossings without actually drawing a sound. You can do it at the lower half, middle, and upper half to practice crossing in each part of the bow. Hopefully this makes sense...it's a little hard to explain without demonstrating. Thanks everyone for sharing your own ideas!! December 24, 2017 at 04:14 PM · Ah yes, sudden impulsive playing is obviously when you are at " your musical best " . I rekon if the urge is so great a good way to slake your addiction , would be to keep an old instrument (no strings ) coat the top with sellotape, then rosin up your bow , and play silently till exhausted . I am new to the violin , but as an old blues guitarist , i am playing blues on violin , cant understand why more musicians dont play violin "when they get the blues " talking of "playing with feeling " i think "playing in the dark " once you have learned the piece , "is a big help ". December 26, 2017 at 12:53 AM · I use an electric violin with a heavy mute, menuhin recommended using a mute in general to maintain sensitivity so that takes it another step farther. 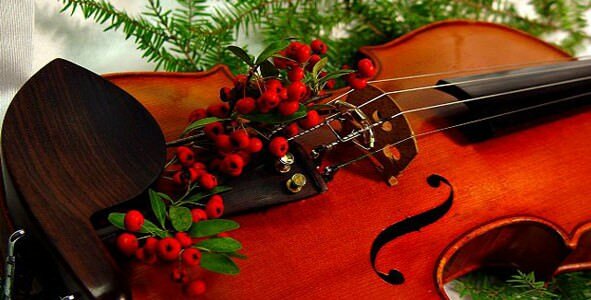 December 28, 2017 at 09:58 AM · I recently injured my left shoulder and I can not hold my violin on my shoulder, let alone play it. I’m really interested in the bow exercises that you do without the violin. Where can I find a detailed description of them?